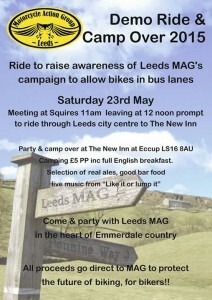 To raise awareness of Leeds MAG`s campaign to allow bikes in bus lanes. Meeting at Squires Cafe Bar, Newthorpe, LS25 5LX from 11am for a prompt departure at 12 noon. All bikes, trikes and scooters welcome.